In 2014, 15 percent of Oklahoma homeowners had earthquake insurance. That seems remarkable for a state that, from 1973 to 2008, had a mere 21 magnitude-3 earthquakes. But it makes sense considering that, since then, the state has become a hotbed of induced seismicity — which is really just a fancy term for man-made earthquakes. In 2016, Oklahoma experienced 500 magnitude-3 earthquakes. So the state’s residents, forced to adapt to these new, unnatural disasters, began to purchase earthquake insurance. “There is a higher take-up rate in earthquake insurance given the last few years, [because of] the increased seismicity our state has seen,” John Doak, Oklahoma’s insurance commissioner, told WhoWhatWhy. The waste products of hydraulic oil fracking, otherwise known as toxic wastewater, cause these earthquakes. The wastewater gets pumped to the surface and injected back into the earth at various depths. 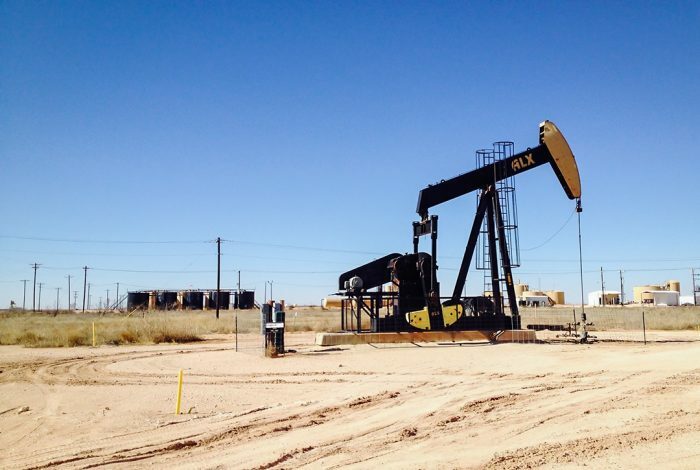 “Wastewater injection can induce small earthquakes to occur, leading to larger ones, in a cascading effect,” said Jacob Walter, the Oklahoma Geological Survey’s lead seismologist. He noted that the area in which the wastewater is injected has no clear correlation to where the earthquake will occur, because of the countless earthquakes triggering each other in unpredictable patterns. Water is mixed with fracking fluids before being injected into the ground. Photo credit: Joshua Doubeck / Wikimedia Commons (CC BY-SA 3.0). These unpredictable earthquakes can have devastating effects on homes, buildings, and infrastructure. Among the most quake-prone buildings: brick structures and those made of unreinforced masonry. 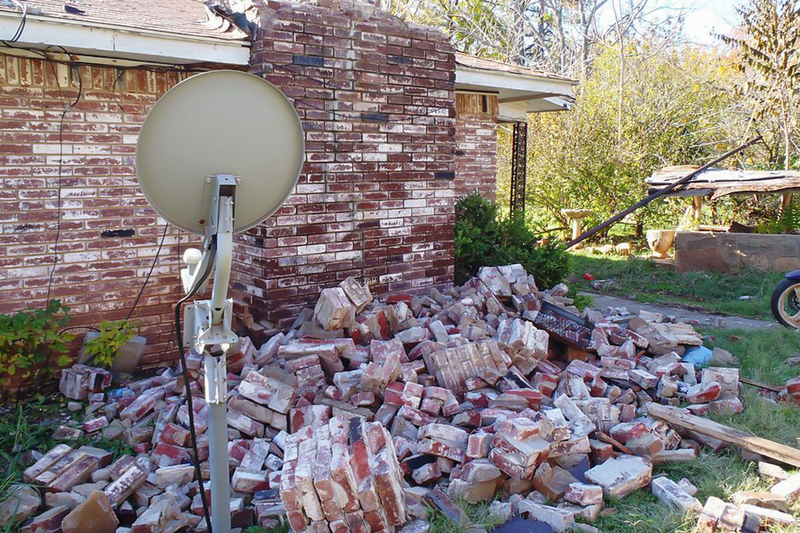 “The larger earthquakes — magnitude 4.0 and larger — have the potential to damage structures, in particular unreinforced masonry walls,” Scott Harvey, assistant professor at the Oklahoma University School of Civil Engineering, told WhoWhatWhy. That means the tremors often affect buildings that provide indispensable services after earthquakes, such as police stations, fire stations, and city halls; these tend to be built of unreinforced masonry. For instance, the Cushing Police Station is made of brick, as is the Pawnee City Hall. Both places experienced powerful earthquakes in 2016. To make matters worse for the citizens of Oklahoma, insurance companies know how vulnerable unreinforced masonry is. The Oklahoma Department of Insurance says on its website that houses built with brick or rock are not usually covered under standard earthquake insurance, or sometimes not at all. Two Oklahoma insurance companies, Lynnae Insurance Group and ECI Insurance, openly state that unreinforced masonry is an expensive add-on to existing earthquake insurance. The cheapest insurance costs between $30 and $50 annually. However, when it covers unreinforced masonry, it can range from $300 to $400 a year. This spike in price can accumulate over the years into a punishingly large amount of money, especially when earthquake insurance is such a necessity. In addition, earthquake insurance is typically subject to large deductibles. And, even though they are not the ones who induced the tremors, regular people end up holding the bag because, as of now, the oil companies causing the quakes refuse to pay for any of the costs, insurance or otherwise. That doesn’t sit well with Oklahomans who are experiencing this new strain on their wallets. Earthworks, a non-profit organization formed in 2005, strives to protect the earth and its inhabitants from the destructive effects of oil and mineral extraction. The citizens of Oklahoma are currently struggling with two giants: the raw power and damage of earthquakes, and the large corporations that refuse to provide aid or take responsibility for their actions. Meanwhile, Brockovich is assisting one community that refuses to be silent — the Pawnee Nation of Oklahoma. Brick structures are especially susceptible to damage during an earthquake. Photo credit: Brian Sherrod / Wikimedia Commons (CC0). 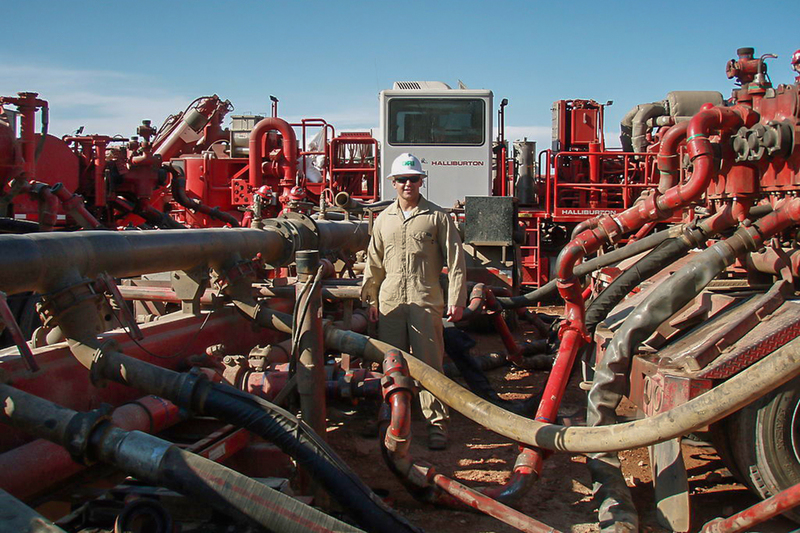 The money and power that the oil and natural gas corporations wield — and spend on influencing politicians and hiring the best lawyers — gives rise to a perception that they can continue their operations without being called to account for Oklahoma’s induced earthquakes. Now the citizens of the Pawnee Nation are using tribal law to push back against having to pay for earthquakes caused by fracking. On September 3, 2016, a 5.8-magnitude earthquake struck the Pawnee Nation. It damaged every historical building at the Pawnee headquarters — all made of unreinforced masonry and many over one hundred years old. That includes buildings in the national register of historic places. The Pawnee Nation had the foresight to obtain earthquake insurance in 2009, when the rise in induced earthquakes began. So, one might think the nation would be spared the worst consequences of the man-made of disaster. Not only did the historic buildings suffer damage, so too did the houses of many Pawnee citizens. After the 2016 earthquake hit, more than 30 tribal members reported damage to their homes. To make matters worse, not many tribal members can afford earthquake insurance, so the affected homeowners had to bear all costs out of pocket. But the damage done was not just material. “I think the thing that hurt the Pawnee Nation most is just the damage to our citizens’ psyche,” Knife Chief said. Unlike the city of Pawnee — which also suffered damage — the Pawnee Nation has the ability to control who uses its land and for what. Within the nation’s sphere of influence, it has considerable power. “We have a responsibility under our constitution to preserve the natural resources and protect our citizens, so that is what we are doing,” Knife Chief said. The oil companies attempted to argue that the case should be brought in a state court. However, Judge Dianne Barker Harrold ruled in favor of the Pawnee Nation, stating that this issue was to be resolved under the Pawnee Nation court of law. The trial was moved on to the discovery phase on October 27, 2017. Eagle Road Oil LLC and Cummings Oil Company, the two companies named in the lawsuit (the others were unnamed), did not respond when WhoWhatWhy reached out to them for comment.